Without a doubt, working with a board of directors comes with challenges. Any group of people has its difficulties, and boards are usually filled with opinionated, strong-willed, highly successful people. These groups of smart, opinionated people are usually serving on a board because they genuinely care about the organization, want to see it succeed, and have several different ideas about how to make that happen. Still, even though it isn’t always easy, I’ve always liked working with a board. 1. It’s a constant leadership lesson. I went to work for my first board of directors when I saw 27 years old. I was hired as the chief operating officer of a trade association after working for several years in state government. The membership in our association was primarily made up of small business owners, and I had spent my entire career in the public sector. I had never known a small business owner. In the years I worked for that association many of our directors became mentors to me. It was like getting an MBA—except better, because I have an MBA, and I learned far more from my board about what it takes to be a small business owner than I ever did in my classes. That knowledge helped me eventually start my own consulting business, and I still use some of those board members as mentors. 2. Boards are filled with good people. If you serve on the board of a nonprofit, a credit union, a community bank, a school district, a co-op, or a trade association, you aren’t doing it for the riches. If you serve on the board of an organization like that, you do so out of a genuine passion for the organization and the belief that you can make a difference. That doesn’t mean these boards don’t have their share of high-maintenance prima-donnas, but they are high-maintenance prima-donnas who mean well and are trying to make the world a better place. Some of the kindest, most thoughtful people I’ve met served on boards I worked for, and my life is better for having known them. 3. Working with a board stretches your capacity. Boards of directors are filled with politics. Not politics as in Republicans/Democrats politics, but politics as in multiple big personalities trying to co-exist in the same room (so, in that way, a little like Republicans and Democrats). One of the things I enjoyed most about working with a board is trying to get directors on the same page, trying to understand which issues they cared about most, and working to broker compromises when a compromise was needed. In one instance, a conflict between directors over a board policy became so heated that it looked like a lawsuit was inevitable, which required me to facilitate a behind-the-scenes compromise that allowed both board members to save face in front of their colleagues. It sounds stressful, but it challenged my skills and stretched my capacity. One day, if I’m ever able to broker peace in the Middle East, I’ll look back to my first lesson in creating agreement where only conflict seemed possible while working for a trade association of small business owners. 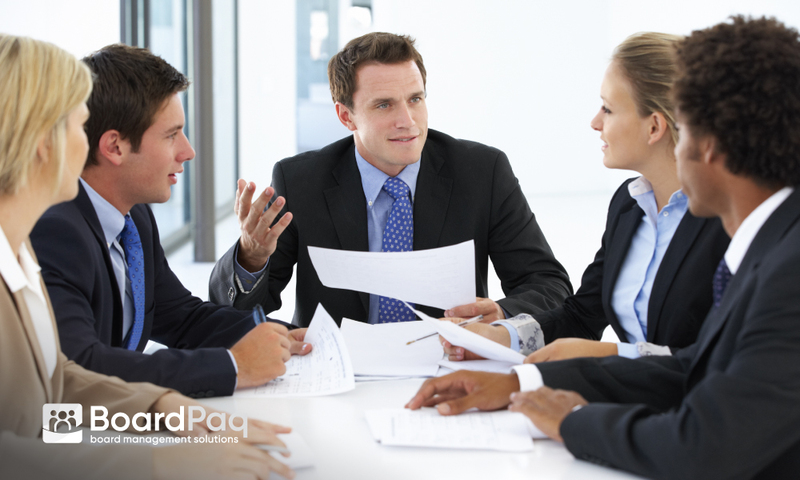 Working for a board comes with challenges, and I didn’t have a board portal like BoardPaq to help ease the logistical burden of working in a small organization led by a board of directors. Still, I’ve always enjoyed working for a board—and if you’re working for a board now, you’re lucky. Remember that, next time you have to broker peace in the Middle East…I mean, boardroom.